Maintaining professional connections is important, and although I’m on a Marie Curie fellowship in London, I still meet frequently with leaders from my home institution, Dublin Institute of Technology (DIT). Last night I met with Dr. Avril Behan (my direct line manager at DIT) in London, our recently-retired boss Professor Kevin Kelly, and DIT’s president Professor Brian Norton. The London DIT Alumni chapter hosted a brilliant get-together, an annual event, at London’s Irish Center. This gave me a chance to meet DIT alumni working in London and also catch up with Avril, Kevin, Brian, and other DIT staff like Ciara Ahern. I also had the pleasure of meeting anew many DIT graduates: MBA Tania Eyanga, Architecture Technologist John Heaney, daylighting designer Dr. Ruth Kelly Waskett, and engineers Paul Sheridan and Stephen Sunderland who work with WSP. I’ve attached photos of the event as well as a few pics from Professor Kevin Kelly’s retirement party, held at DIT a couple of weeks ago. At last night’s gathering, Professor Brian Norton provided updates on DIT’s new campus at Grangegoreman, and delivered the exciting news that a pedestrian route connecting Grangegoreman with DIT Bolton Street has just opened. The walk now takes just seven minutes and cuts through Kings Inn Law building, a truly stroll walk up Henrietta Street to Constitution Hill. Can’t wait to use this route! It will cut about 15 minutes off the current walking time between the two DIT sites. DIT President Brian Norton with Fulbright Scholar Shannon Chance. DIT’s graduation ceremony is an event to behold! Today’s occurred at St. Patrick’s Cathedral (which is the largest church building in Ireland). You may recall that Kitty Lee, Patty, and I visited it last week. At DIT exams for the fall semester occur in January, and winter graduation falls shortly after. During the ceremony, each graduate’s name, degree title, and thesis topic is announced. Today’s list of topics highlighted valuable contributions DIT is making to society in areas such as physics, health and nutrition, energy, and computing. 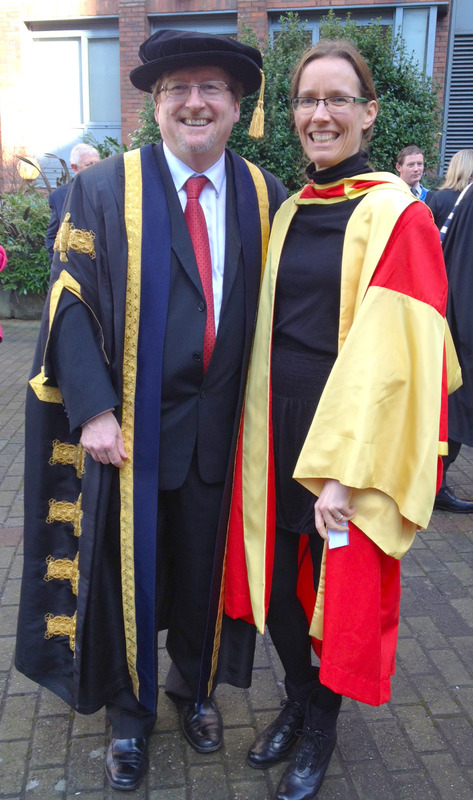 Today also presented my first opportunity to meet DIT’s president, Prof. Brian Norton in person. When the opportunity appeared, I stepped forward without hesitation, extended my hand, and introduced myself. I was truly dumbfounded when Dr. Norton said he knew who I was and that he had read my blog. Wow! I look forward to meeting him again soon. Fergus Wheelan’s insightful book on Irish/Dublin history of the 1600 and 1700s. At the reception, I also met a few members the electrical engineering faculty I haven’t yet gotten to know. I hope to have more to tell about their work soon. I’ve included some photos of the day, including a snapshot of the English and Protestant flags hanging in St. Patrick’s (Protestant) Cathedral. 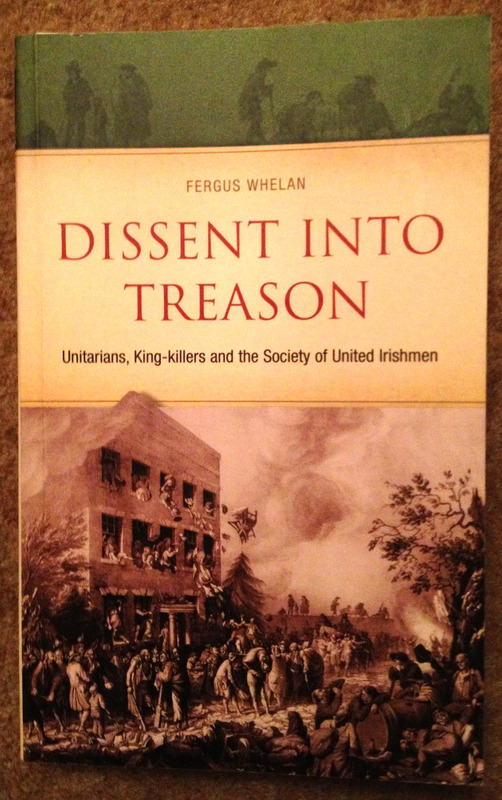 Upon returning to my apartment, I curled up with Fergus Whelan‘s book Dissent into Treason. In the first chapter, Fergus does a remarkable job of explaining the formative roots of various Western denominations. I’ve learned so much in just 20 pages… including distinctions between Unitarians, Presbyterians and Congregationalists, Quakers, Levelers, Catholics, and the like. I believe Dissenters were people whose supported the creation the Irish nation despite pressure from their larger brethren and/or religious underpinnings to support the English crown. I’ll gain clarity on that soon, I’m sure. Have you ver wondered why more Protestants read the Bible today than Catholics (in the US at least)? I certainly have. Fergus’ book explains that in Ireland in the 1600s, Catholics were only permitted to read scriptures in Latin or Greek. Protestants were given freedom to read in English. Hummmm. In Ireland there’s so very much to discover. I’m trying to make the most of every moment, but there’s not nearly enough of time to do, see, and learn all I’d like…. The fabulous dean Mike Murphy with Shannon Chance. The procession felt a bit like being a (Protestant) monk!?!! DIT’s Graduation Ceremony was beautiful at St. Patrick’s Cathedral (February 2013). Look closely at the flags and you’ll notice Union Jacks hanging in St. Patrick’s Cathedral. Our (US American) first names are their (Irish) last names, as you can see in the gradation program (including my family’s favorites, Heather, Shannon, and Meredith). After the formalities, we headed back to Aungier Street for a reception.